Celebrate the changing seasons by decorating your front door with a handmade fall wreath. Whether you want an adorable decoration to welcome trick or treaters or you'd like to add a touch of natural autumn style to your home, these fun and easy wreath designs will garner compliments and allow you to express your creativity. Purchased owl decorations can do more than adorn tabletops and other surfaces; they also make fantastic focal points for fall wreaths. For this sweet design, you'll need to purchase an owl decoration from your local craft store. Add some fun floral elements and an hour of your time, and you'll have the cutest front door in your neighborhood. Place the grapevine wreath on your work surface and decide on an orientation for it. It's nice to have a larger, straight branch near the left, bottom side for a perch for the owl. Lightly brush the wreath with gold craft paint to highlight some of the branches. Allow it to dry. Begin threading some of the grass stems through the grapevine wreath, allowing some of the loose ends to stick out. Start near the center top and end near the center bottom, following the wreath's left side. Repeat this process with the dried flower stems. Use the scissors to cut the flowers or berries off of the silk flower stems. Discard any leaves or artificial grasses. Tear off a piece of brown floral tape and wrap the stems of the silk flowers. This will help them blend in with the grapevine wreath, giving a more natural look. Insert the silk flowers or berries into the wreath, following the same path you made with the grasses. You should cover the left side of the wreath. When you reach the spot where you owl will perch, reverse direction with a few of the flowers. Cut two pieces of floral wire, each about 10 inches long. Wrap a piece around each of the owl's ankles, twisting to get a tight fit. 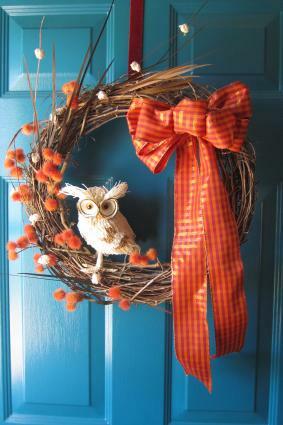 Place your owl in the desired spot, and then twist the ends of the wire around branches in the wreath. Adjust the silk or dried flowers to hide the wire. Make a bow out of the ribbon and attach it to the upper right portion of the wreath. Hang your wreath and enjoy. 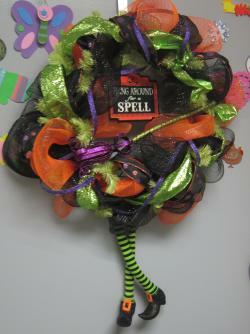 This easy and adorable witch wreath makes a great Halloween decoration for your front door or for inside your home. It uses deco mesh and a prepared wreath form, which makes it go together quickly. You can create this decoration in about half an hour. You can make a decorative mesh ribbon wreath by cutting the mesh or by leaving it whole. The choice is up to you, depending on the look you want. These instructions leave it whole. You may be able to find many of the supplies you need at your local craft store, but you can get everything at once if you order online. The supplies for this wreath came from CraftOutlet.com. Place the wire work wreath face-up on your work surface. There will be ties all the way around the wreath form. Unroll some of the black mesh and secure the end to the wreath form using one of the ties. Make a small pouf of mesh and secure it to another tie in the same way. Continue working your way all the way around the wreath form. You can skip every other tie as you go. Leave the black mesh uncut, but begin the same process with the orange mesh. Go all the way around the wreath with the orange mesh and cut it when you reach the place you started. Follow this with another layer of black mesh. You may have to untwist the ties for a moment to add another layer. Stop adding mesh when the wreath is as full as you want it. Next, begin adding a layer of ribbon. Go all the way around the wreath with one type of ribbon, and then repeat with the other type. Use the ties to secure it. Weave the purple glitter strapping through the loops of mesh to give the wreath a little more interest. Tuck the loose ends in behind the wreath. Bend the wire ends of the witch legs into a hook and loop them through the wreath form behind the mesh so they hang down from the bottom of the wreath. Cut two pieces of craft wire, each about one foot long, and use these to attach the broom so it rests in the center of the wreath. Cut two more pieces to attach the Halloween sign, allowing it to hang in the middle of the wreath just above the broom. Hang up your wreath and enjoy it! When you start to feel an autumn chill in the air, it's a great time to make seasonal decorative wreaths. These cute fall designs will help brighten your home, and they'll show everyone your enthusiasm for this beautiful season.